Foods packed with nutrients often earn the title of "superfood." Guess that makes these superfood-packed creations SUPERRECIPES! This meal is SO good, we made it a four-serving batch. And guess what? It tastes even BETTER the day after it's made...Just reheat 'n eat! Preheat oven to 400 degrees. Spray 2 baking sheets with nonstick spray. Place halved Brussels sprouts and mushrooms in a large bowl. Drizzle with oil, and sprinkle with 1/4 tsp. salt and 1/8 tsp. pepper. Toss to coat. Transfer Brussels sprouts and mushrooms to baking sheets. Add onion, and evenly space out all veggies. 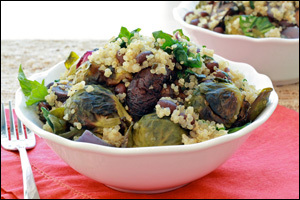 Bake until mushrooms and onion have softened and Brussels sprouts have slightly browned, 35 - 40 minutes. Meanwhile, in a medium pot, combine quinoa, garlic, and 2 cups water. Bring to a boil, and then reduce heat to low. Cover and let simmer for 15 minutes, or until water has evaporated and quinoa is fully cooked. Transfer cooked veggies and quinoa back to the large bowl. Add remaining ingredients, including the remaining 1/4 tsp. salt and 1/8 tsp. pepper. Mix to combine. Enjoy! This decadent kale creation is a delicious dream come true. We PROMISE. Bring a large skillet sprayed with nonstick spray to medium-high heat. Cook and stir onion until softened and lightly browned, about 5 minutes. Add kale, garlic, and 1/2 cup water. Cover and cook until kale is tender, about 5 minutes. Remove lid, and reduce heat to low. Add mayo, salt, and cheese wedges, breaking the wedges into pieces. Cook and stir until cheese has melted, mixed with mayo, and coated veggies, about 2 minutes. Enjoy! Hungry for More Superfood Recipes? Salmon is full of omega-3s and protein. This foil pack is full of salmon and deliciousness. 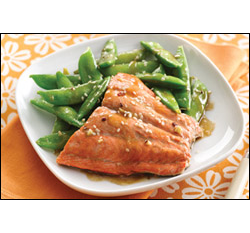 Make the Sesame Salmon & Snap Peas en Foil today! Blueberries earn superfood cred because they're high in antioxidants and fiber. And our creamy quinoa is like oatmeal's protein-packed cousin. This Hot 'n Fruity Quinoa Bowl is one super breakfast! 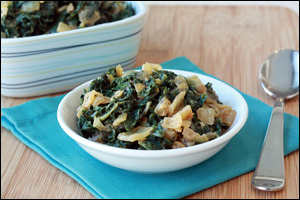 Here's another kale dish that'll win your heart. Our fresh 'n fruity Holiday Harvest Kale Salad is wildly delicious! Be a super pal and share these super recipes... Click "Send to a Friend" now! It's National Fig Week, the first week in November! Figs are tasty sources of potassium and fiber with under 40 calories per medium fruit. Click for more figgy info from our pals at The World's Healthiest Foods!